Phase-contrast images of RPBJ- and HNF6-deficient hepatocyte spheroids embedded in collagen gels and cultured in the presence or absence of the TGFβ inhibitor SB-431542 (SB) for the indicated number of days. LDN induces signifiant cell death. 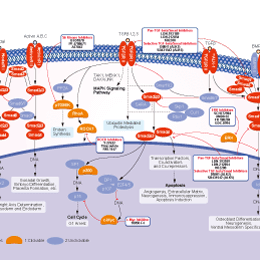 OVCA429 cells were treated with vehicle (DMSO) or experimental drugs for 6 hr to capture different stages of cell death. OVCA429 cell viability was assessed in response to drug treatment for 6 hr by staining with AO (green) and EB (orange). For clarity the different fluorescent channels to detect AO, EB, and the over-lapping images are shown for 10 mM LDN treatment. LY 3200882 is a potent, highly selective inhibitor of TGF-β receptor type 1 (TGFβRI). It potently inhibits TGFβ mediated SMAD phosphorylation in vitro in tumor and immune cells and in vivo in subcutaneous tumors in a dose dependent fashion. SB505124 is a selective inhibitor of TGFβR for ALK4, ALK5 with IC50 of 129 nM and 47 nM in cell-free assays, respectively, also inhibits ALK7, but does not inhibit ALK1, 2, 3, or 6. (D): Fluorescence micrographs of SOX2/FOXA2 double-staining of the conditions mentioned above. The TGF-b inhibitor SB-505124 (1 mM) was additionally used together with the complete medium. Nuclei were counterstained with DAPI. Original magnification 310 or 340. Abbreviations: DAPI, 40,6-diamidino-2-phenylindole; RA, retinoic acid. Immunofluorescence staining of myosin (red) when TGFb2 and TGFb3 were inhibited using pirfenidone. Nucleus was stained with DAPI (blue) Scale bars: 200 μm. Magnification: 100×. GW788388 is a potent and selective inhibitor of ALK5 with IC50 of 18 nM in a cell-free assay, also inhibits TGF-β type II receptor and activin type II receptor activities, but does not inhibit BMP type II receptor. Combination treatment with GW788388 and IL-23 aiming to sustain Th17 cell levels increases spleen cell production of the inflammatory mediators IL-17 and TNF-a, the stimulatory mediators IL-2, IFN-g and RANTES, and the inhibitory mediator IL-10. Starting from Week 6 of 4NQO administration, when premalignant oral lesions were detectable on the tongue, mice were initiated on treatment with diluent, GW788388, IL-23 or both GW788388 and IL-23. After 2 months of these treatments, spleens were collected and cultured on anti-CD3 for 3 days. Supernatants were collected and used for measurement of the inflammatory mediators IL-17, TNF-a and IL-6 (a); stimulatory mediators IL-2, IFN-g and RANTES (b); and inhibitory mediators, TGF-b, IL-4 and IL-10 (c). *=p<0.05, **=p<0.01, ***=p<0.001. LY364947 is a potent ATP-competitive inhibitor of TGFβR-I with IC50 of 59 nM in a cell-free assay, shows 7-fold selectivity over TGFβR-II. Western blotting analysis of b-catenin, TCF3 and LEF1 levels in HT-29 cells. LDN193189 HCl is the hydrochloride salt of LDN193189, which is a selective BMP signaling inhibitor, and inhibits the transcriptional activity of the BMP type I receptors ALK2 and ALK3 with IC50 of 5 nM and 30 nM in C2C12 cell lines, respectively, 200-fold selectivity for BMP versus TGF-β. A549 cells were transfected with miR-205 inhibitor (IHT-205, 100 nM). Forty hours after transfection, the cells were seeded on transwell plates and treated with or without inhibitor K02288 (10 nM), AG1478 (1 µM), SB431542 (10 µM) for 10 hours. Migrated cells were quantified. All data are shown as mean± SD. N =3. All experiments have been repeated at least 3times independently. SIS3, a novel specific inhibitor of Smad3, inhibits TGF-β and activin signaling by suppressing Smad3 phosphorylation without affecting the MAPK/p38, ERK, or PI3-kinase signaling pathways. Cultured cardiac fibroblasts infected with vector lentiviruses or EphrinB2 overexpressing lentiviruses were stimulated with specific antagonist against Stat3 (Stattic, 2.5μM) and/or Smad3 (SIS3, 1μM), respectively. The expression level of α-SMA was quantified via western blotting. In vitro experiments repeat 3 times, *P<0.05, **P<0.01. Vactosertib (TEW-7197) is a highly potent, selective, and orally bioavailable TGF-β receptor ALK4/ALK5 inhibitor with IC50 of 13 nM and 11 nM, respectively. Phase 1. Representative immunofluorescent images of HuL6 cells treated with EW-7197, TGF-β1, both, or neither for 72 h. Scale bars, 20 μm. The combined treatment with miR-140-5p mimics and some common chemotherapeutics did not have any effect on the SK-MES1 cell line, whereas miR-140-5p and DMH1 and cisplatin decreased the proliferation of the A549 cells. Data are presented as mean±SEM of three individual experiments undertaken in triplicate. t-Test was used to assess significance with *p<0.05. Hesperetin is a bioflavonoid and, to be more specific, a flavanone. Alantolactone, a naturally occurring eudesmane-type sesquiterpene lactone (SL), could induce activin/SMAD3 signaling and disrupt Cripto-1/activin receptor type II A interaction. Colon cancer cell lines (A) SW620, (B) HCT116, and (C) HT29 were treated with different concentrations (60, 12, 2.4, 0.48, and 0.098 μM) of nifuroxazide (nifu), niclosamide (nicl), cryptotanshinone (cry), and a lantolactone (ala), respectively, for 72 h. Cell proliferation in each group was detected by MTT assay. (D) HCT116, SW620, and HT29 cell lines were suppressed with niclosamide treatment at different concentrations (20, 10, 5, 2.5, and 1.25 μM) for 72 h. Subsequently, cell proliferation in each group was detected by MTT assay. The data were obtained from 3 independent experiments.